I am all packed and I leave tomorrow which leaves me with a day to wander around in circles and wonder about what I have forgotten. So, before I drive myself crazy, I think I should sit down and write a blog post. Late last week I picked up from the post office a box of ten fajas, belts, that I had ordered from Maxima and the weavers in the communities in and around Independencia in Cochabamba. 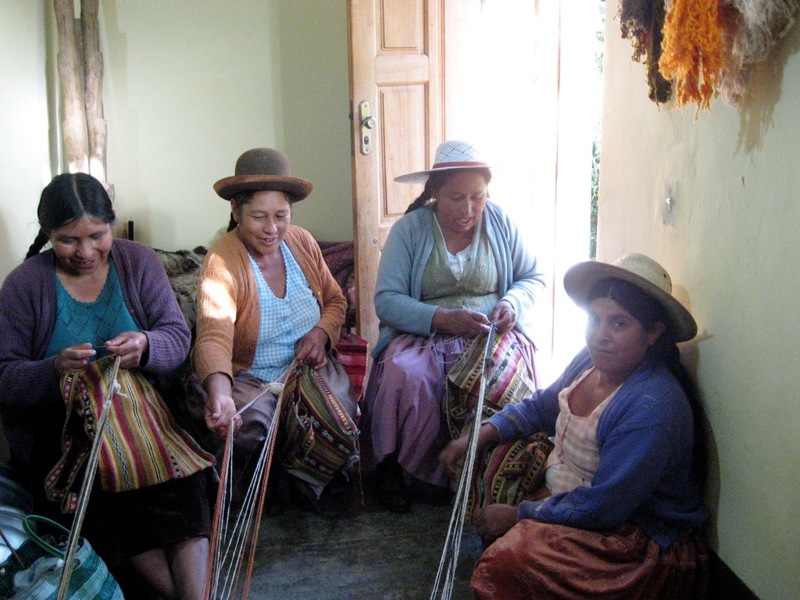 (All photos of the weavers except for the first one, are taken from the PAZA webpage with the kind permission of Dorinda Dutcher). 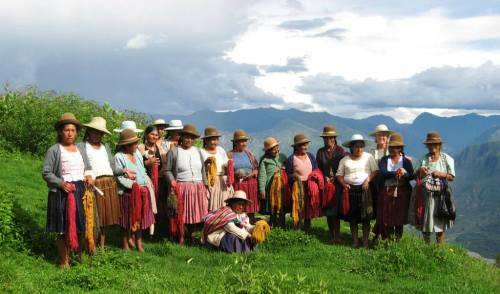 These are the ladies with whom American Dorinda Dutcher has been working for years, helping them to recover and pass on their spinning, dyeing and weaving skills and market their woven goods. If you follow my blog, you will have seen pictures of and heard stories about Maxima Cortez, one of the women with whom Dorinda has most closely worked. She is the coordinator of the various Handicraft Group activities. 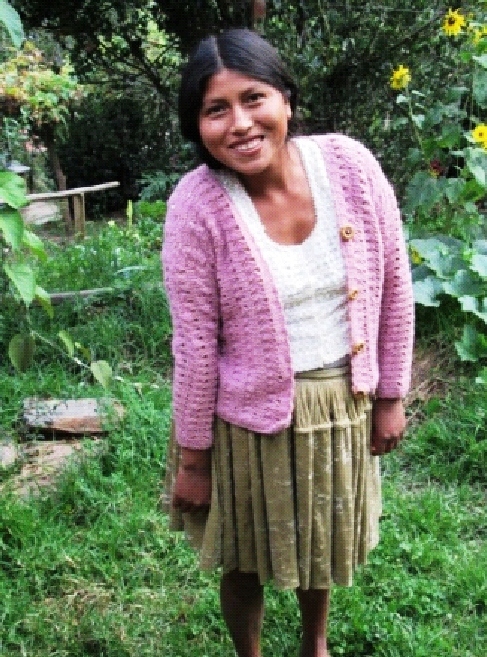 Maxima is one of my weaving teachers and was my roommate at the Tinkuy in Peru. Maxima, daughter Soraida and granddaughter Nilda were my weaving companions for my three-day stay in Cochabamba. The flock belonging to Casimira, one of the spinners and weavers who made the bands in my order. I opened the box of fajas and saw the two colorful packages of neatly folded and stacked bands each with a label detailing the name of the weaver and her community. It was such a happy sight but, what really hit me, was that wonderful aroma of wool mixed with the various smells of the natural dye substances that are used to create the colors. It was such a strong fragrance that my cat immediately awoke and had to come over to roll in the bands. And then there were the textures. 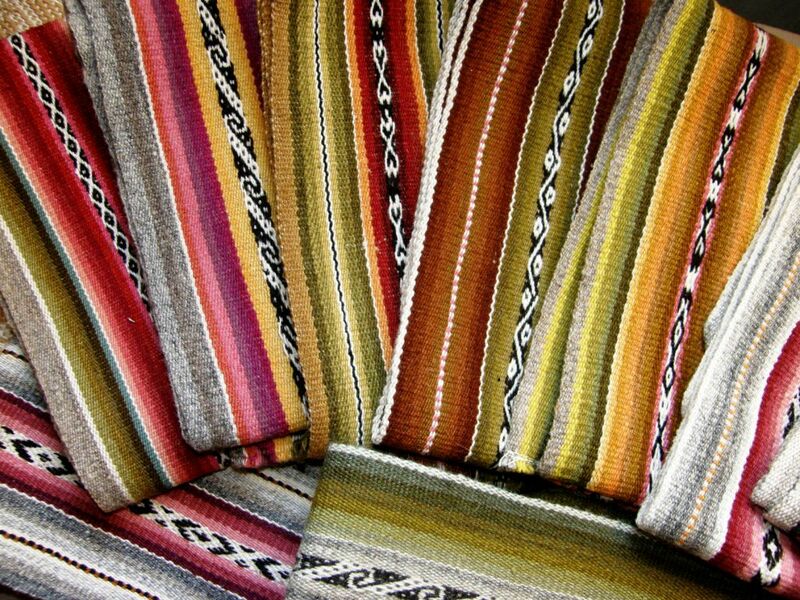 Each weaver and spinner has their own style and beat and the bands varied from those that were smooth and taut to those which had more dimension and drape. I counted eight different tones from cochineal dye and even more shades of green and then closer inspection helped me to see which ones were most likely made by the younger members of the communities…the ones where the weaver jumped a little erratically from pattern to pattern spoke of a youngster who was keen to try out her entire newly acquired repertoire in the one piece. Perhaps the ones that have some little flaws are from the youngsters too or maybe they are from mothers who were distracted for a moment by one of their little ones. Each one tells a story and it is strange sitting here in this tropical heat and imagining the sounds of the looms, the cool green slopes and valleys and music of the highland region in which they were made. 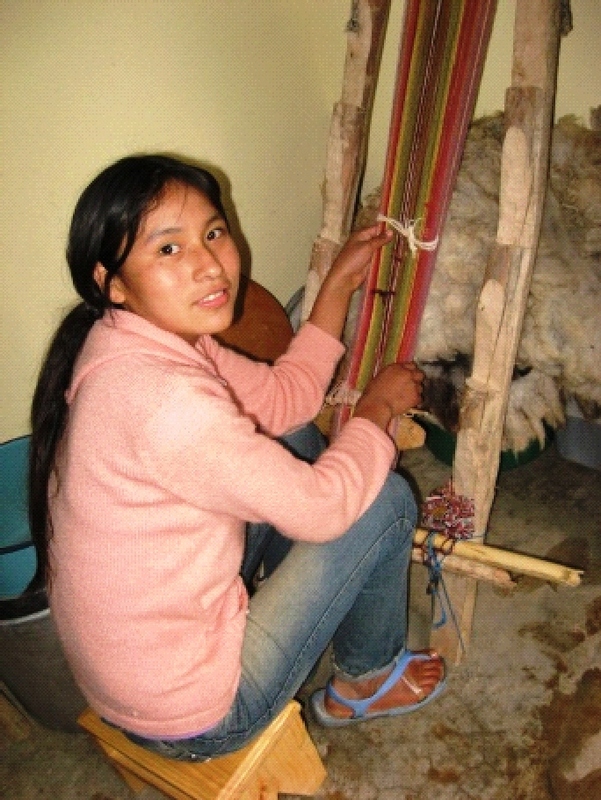 Here is Casimira Calcina working on the leaning vertical loom which is typical of the region. She lives in the rural community of Huancarani. 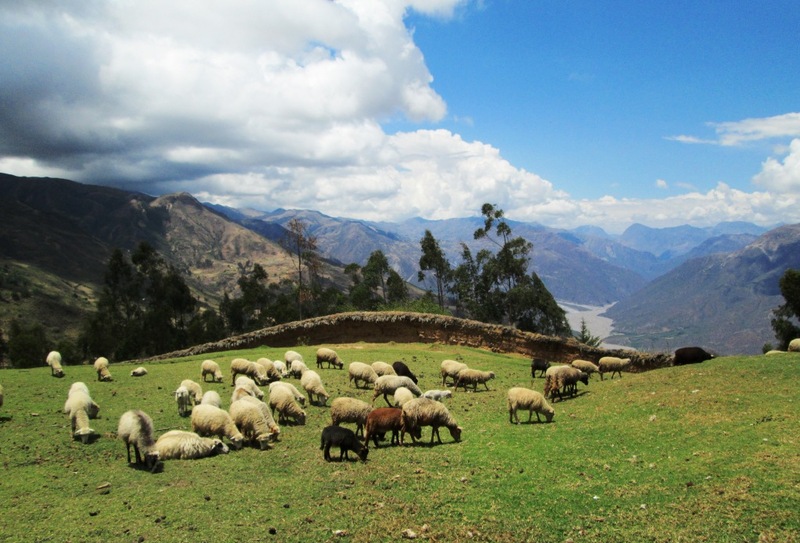 Being widowed and with her children having migrated, she works hard alone to run her farm and tend her flock. Adviana Vargas is 18 and still considered a “chica”. However, she weaves with the adult group as she lives with the father of her 16-month old son and is expecting another child. She is wearing the cardigan that she made after a visiting volunteer opened up the mystery of the patterns and instructions in magazines that had been in the group’s possession for years. Until then no one had had the skills to read and interpret them. 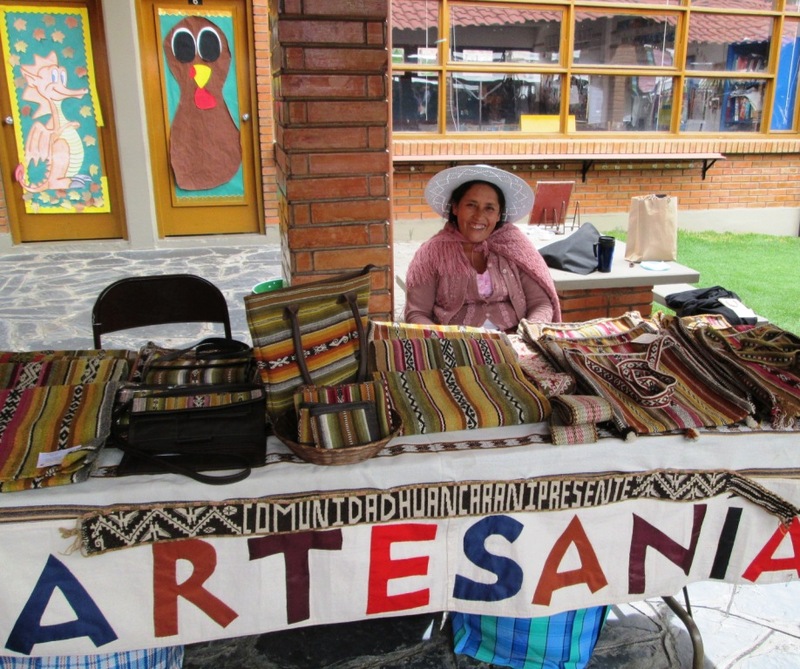 Gabriela Zenteno is 16 and has been part of the Handicraft Club since it began in 2010. She learned to weave from Maxima with additional help from her mother. 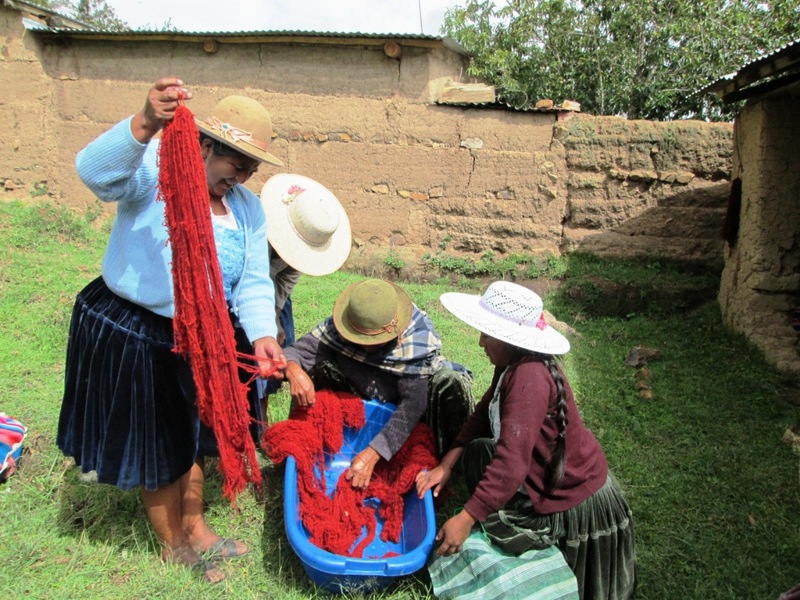 Because the family lives in town, instead of on the farm, and Gaby goes to school, she did not learn to spin and weave at her mother’s side which is integrated into the ancient farmer subsistence lifestyle. Some of the bands were finished with four selvedges and I regretted not having told Dorinda when I ordered that I didn’t need that fourth selvedge. I know the work that is involved in that but, as my teacher Yanet from Pitumarca told us, the four-selvedge finish is “normal” for them. Some of the bands had been cut and then hand sewn to protect the edge. 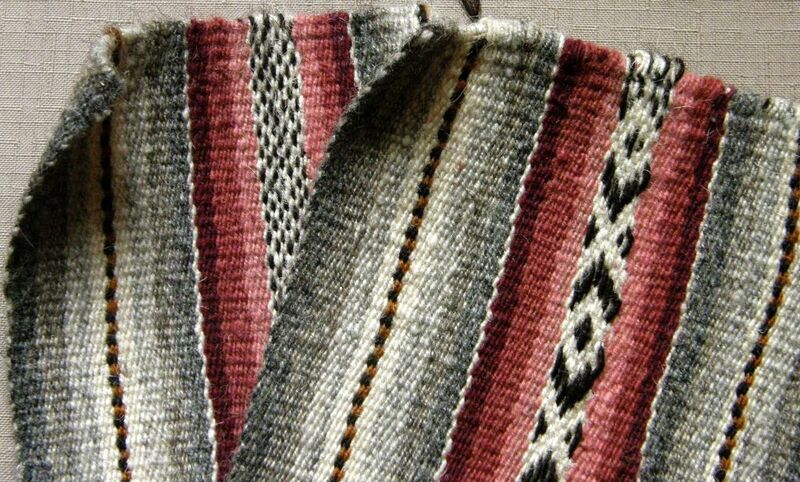 Most had pebble-weave designs and I was delighted to see that two had patterns made with supplementary warps. 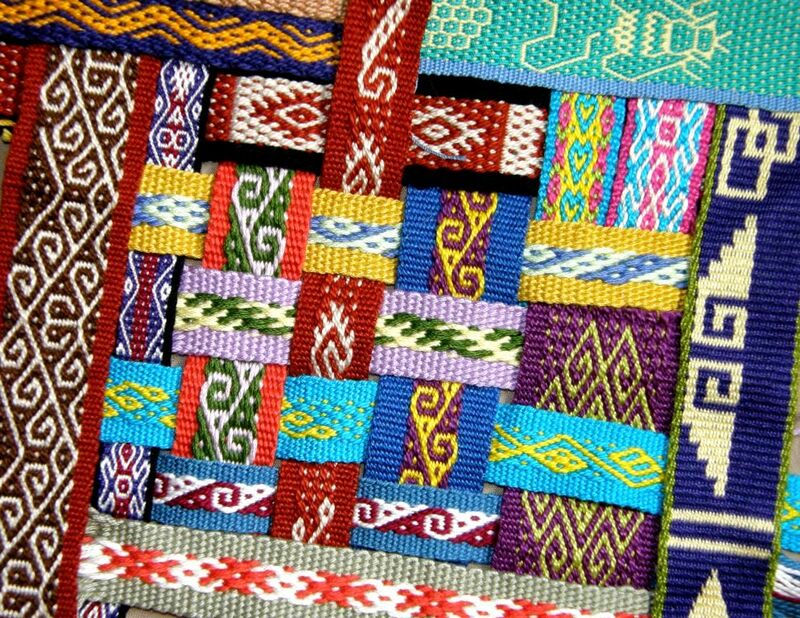 What was very interesting for me was noting that the way the women set up their warps to weave pebble weave varies even among communities that are relatively close together. This information is contained in the “termination” area of the band…the part where, on a four-selvedge piece, the weaver no longer has room to do pick-up and simply uses her two basic sheds to finish. There you can see the order of the colored threads in the two sheds. You can see the termination area of one of the bands which has been patterned with supplementary warps at left. And, happily, among these bands I found my inspiration for the Year of the Snake Weave-along that Ghedrain proposed in the Ravelry Backstrap Weaving Group. The official start of the Weave-along (WAL) was last Friday March 1 but people are free to join in at any time. I expected to be a cheer leader and “Chief Sticky Beak” as I will be on the road as from tomorrow but, with this sudden source of snaky inspiration, I warped up a narrow band to take with me which you can see on the left with its wooly backstrap. 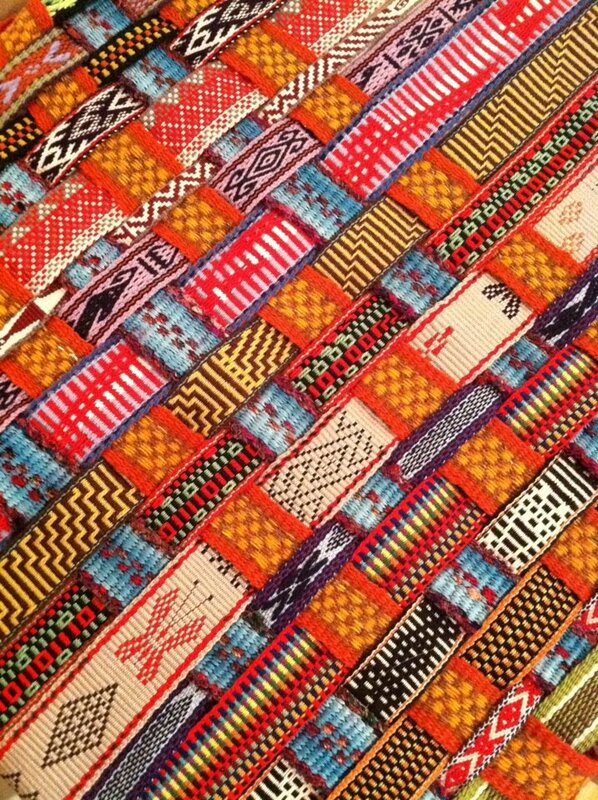 The other project that I am taking is a band using left over Guatemalan cotton from my recent scarf project. I plan to weave in some patterns with supplementary weft and am happy that the collection of spools of silk weighs very little. To tell the truth, I will be surprised if I actually find time to work on these but I really would like to participate in the WAL. 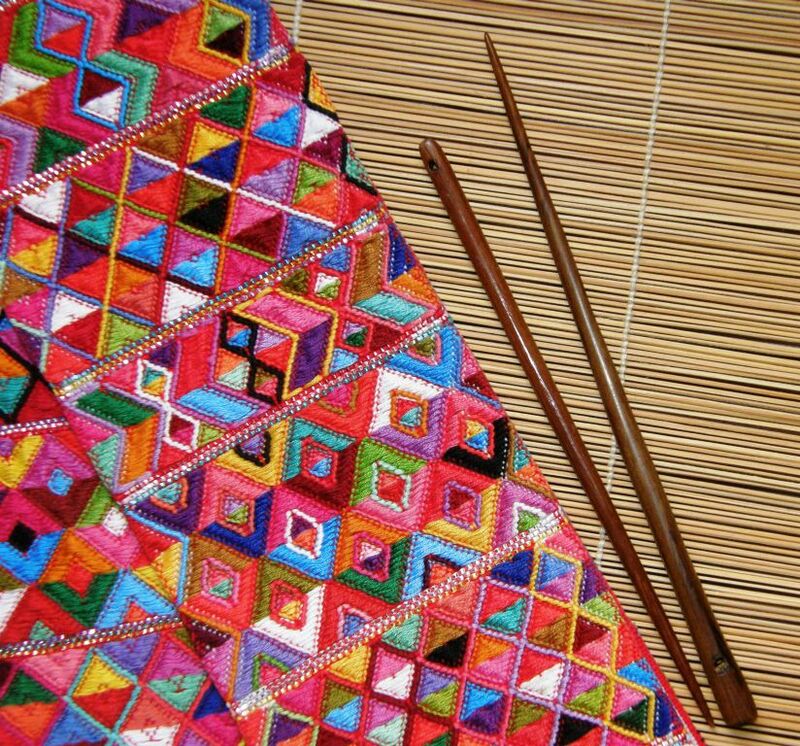 You may remember the lovely pick-up sticks that I brought back from Guatemala which I use on these supplementary-weft projects. Fortunately, I bought two as I was careless with my packing and the very tip of one broke in my luggage on the way home. It’s still useable but not as nice to work with as the other one. 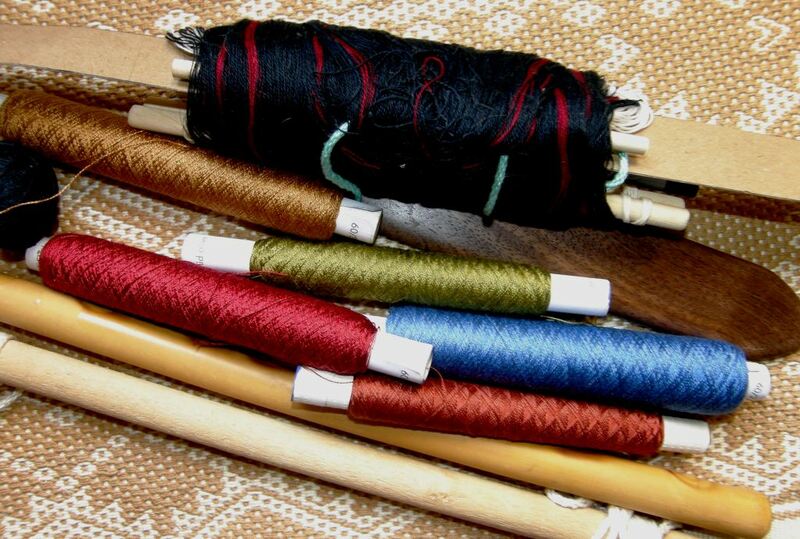 The good news is that Terri from MagicalMoons is now making pick-up sticks that would work beautifully for supplementary-weft patterning and they look gorgeous. Below, you can see my Guatemalan ones. The one on the left is the slighty damaged one. So, the Year of the Snake WAL is underway on Ravelry. Meanwhile, I have some projects from Ravelry members to show you. 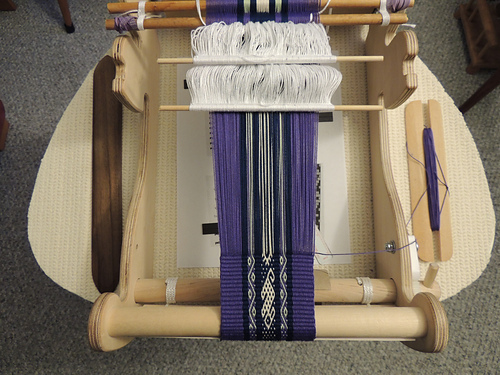 This one is from Backstrap Group member CindyQ who has mounted her warp to weave a band with pebble-weave patterns on the frame of her rigid heddle loom. 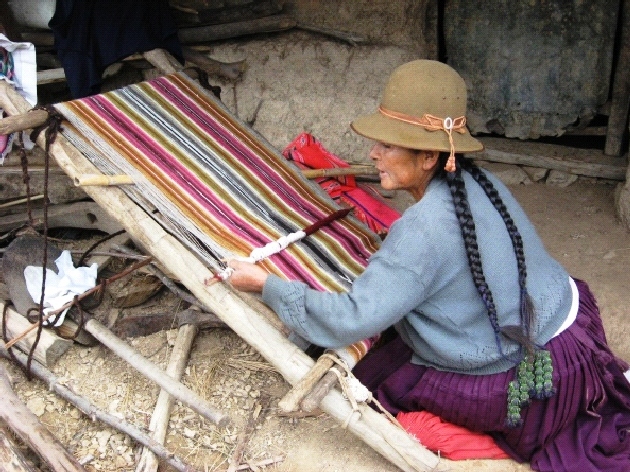 She is using the two-heddle method that I was taught by my Ayacucho weaving teachers which I explain in my first book Andean Pebble Weave….great-looking heddles and lovely weaving! 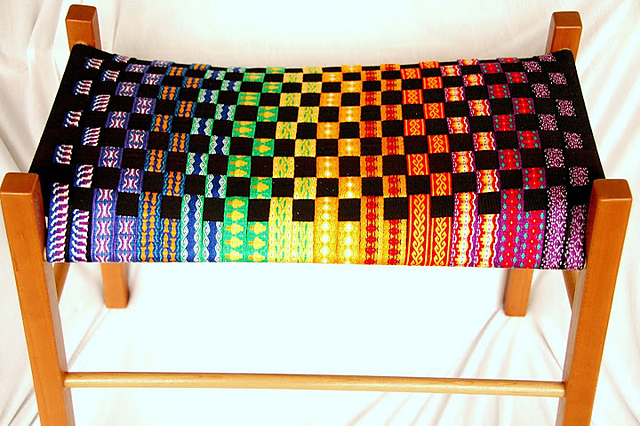 Now, back to Kara…she interlaced bands that she made especially for a project…a cover for the seat of her weaving bench. 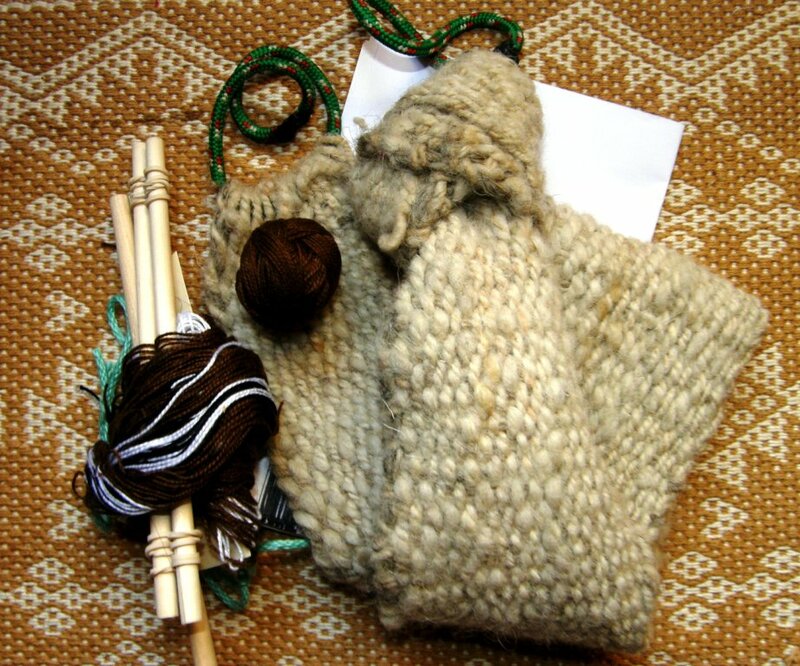 So, she has put together bands made on an inkle loom and with tablets to make not only a stunning display of her work, but also something wonderfully practical…. All those bright bands interlaced with black….WOW! Go gather up your bands now and start planning!! I can see pillow covers and other wonderful things using this idea! Beautiful post! Safe travels Laverne. I look forward to hearing more! Those beautiful fajas make me want to stop working with the limited colors of crochet cotton and to get busy dyeing wool! Are the women putting tubular bands on the edges of something, maybe bags? Can’t wait to learn that. That Magical Moons pick-up stick is tempting, maybe one day I’ll try supplementally weft patterns. Sure love the sword I bought from Magical Moons. You can see it to the left of my loom. Thanks for the contact Laverne. And Kara’s stool. Wow!! I’m speechless!!! I need to weave more! Am looking forward to seeing you soon. Safe travels. Just wonderful, everything! Interesting idea with the interlacing, that is something to save for future projects… Thanks a lot and take care on your journey! Dear Laverne, thank you for your great post. You must be on your way, or probably have arrived in the US by now. 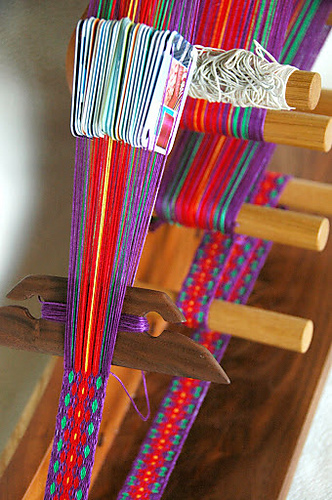 Wish you a wonderful time with lots of weaving/watching and fun. All good here, no weaving going on but plenty to keep life interesting. Flattery will get you anything! Thanks so much for the lovely compliments!